There are many environmental issues associated with alpine skiing, such as soil erosion, deforestation and the positioning of unsightly ski lifts, apart from the problems created by the sheer number of visitors and road traffic. 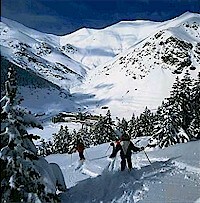 The Vall de Nuria ski resort is unique in that access is only possible by the Cremallera rack and pinion railway or by a tortuous footpath. Altitude of 1.964 to 2.252 metres (difference of 288 metres). Accommodation: Hotel (65 rooms), Apartments (12), Hostel and camp site (94 plots, open April-November).